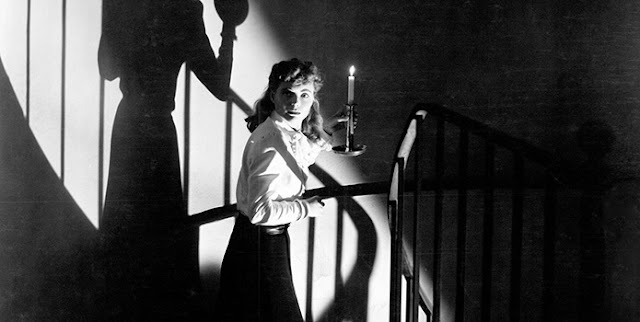 The Spiral Staircase (1946), helmed by the German director Robert Siodmak, is a spooky thriller based on Ethel Lina White’s novel Some Must Watch. It is replete with Gothic elements such as an isolated mansion, a sinister basement, a persistent thunderstorm, lamp-bearing women, and of course a central heroine in peril, here Helen McCord (Dorothy McGuire). She is a mute caregiver at Warren House and in danger of becoming the victim of a madman who targets women with disabilities. Due to the trauma of a childhood tragedy, Helen has lost her voice temporarily. Robert Siodmak’s first feature was People on Sunday (1929) which was co-written by another Hollywood great Billy Wilder. Due to the rise of Nazism Siodmak, like other German film artists of his time, left Germany and found success in Hollywood. 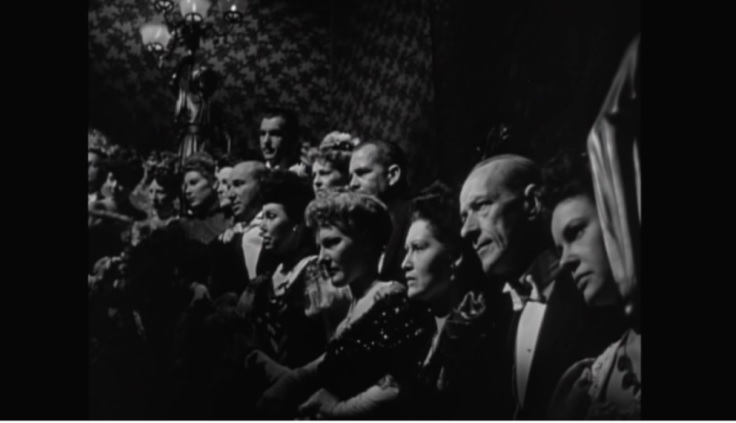 Dark City states that “Like his fellow expatriates from Germany (Otto Preminger, Fritz Lang, and Billy Wilder), Siodmak was trained in the German expressionist film style and lent a European sense to film noir” . The Silence of Helen McCord was the original working title of the film. In many ways it feels more appropriate. The opening sequence takes us inside a village hotel where a silent movie is being screened within a hall. The sequence is like a mini silent film itself; there is no dialogue till the 3:55 min mark. The camera pointedly comes to rest on a placard atop the hall entrance. It pronounces the motion pictures “the wonder of the age”. This declaration, the mixed-case lettering and the playful “and” (which seems to have been added as an afterthought) suggest that cinema is still a novelty in the film. We get our first glimpse of Helen among the audience. A medium close-up of her cherubic face reveals amusement, empathy and wonder at the events unfolding on the screen (a young lady is being given a talking-to by presumably her parents). Perhaps the silent motion pictures remind her of herself: walking, talking people without sound. The dissonance between her amusement and the silent movie’s happenings certainly suggests it. 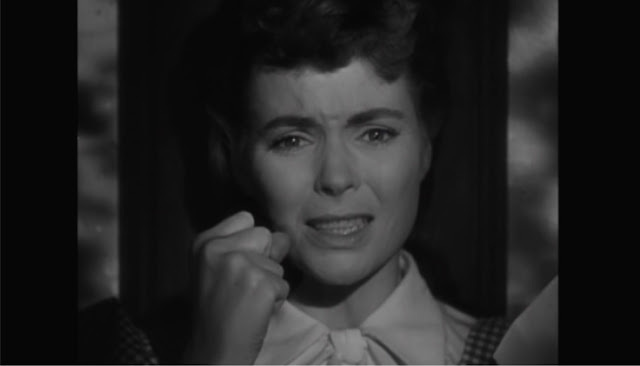 Dorothy shows great skill in displaying so many emotions at once with much subtlety and all in a flash. We sense that this is a girl who expresses herself primarily through her face (at this point we do not know of Helen’s condition). Almost all the remaining characters, be it her superiors or the Warren housekeeping staff, keep up an endless stream of chatter with her, barely giving pause for her side of the conversation. Save for her fiancé Dr. Parry, everyone either orders her about or plunges into expressing their own feelings. 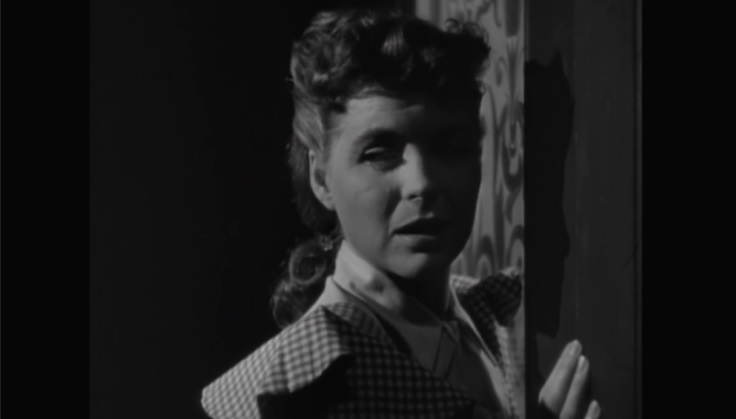 Robert Siodmak brings forth Helen’s insecurities about her voice in several artistic or dramatic ways. A doorway on top of the staircase in the hallway turns out to be a mirror. Only when Helen stops suddenly to examine her reflection, then does it become apparent that it’s a mirror. At first she dusts herself. Suddenly she raises her hands to her throat, mouthing words silently. She stares at the mirror, as if it were a gateway into another world, one where she could speak again. She gazes at her reflection as if she were Alice and she could clamber through the looking glass into the world beyond. The flowery wallpaper, the shimmery light fixture with the twin flickering candles and the choice of composition (depiction of the mirror as a doorway) reinforce this feeling. 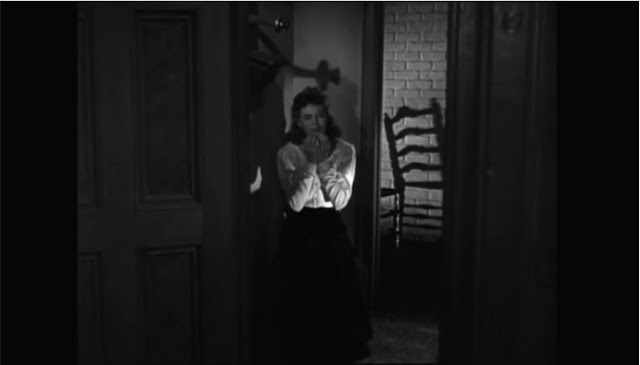 Siodmak also uses his German Expressionist sensibilities to show Helen’s anxiety. Justin Wolf in his guide to Expressionism notes, “Expressionist artists’ representations of the modern city included alienated individuals” . Dr Parry refers to Helen and himself as outsiders. He is frustrated by her reluctance to undergo treatments to regain her voice. He reminds her of the tragic day when she was unable to scream, to force her to relive the painful memory instead of repressing it. 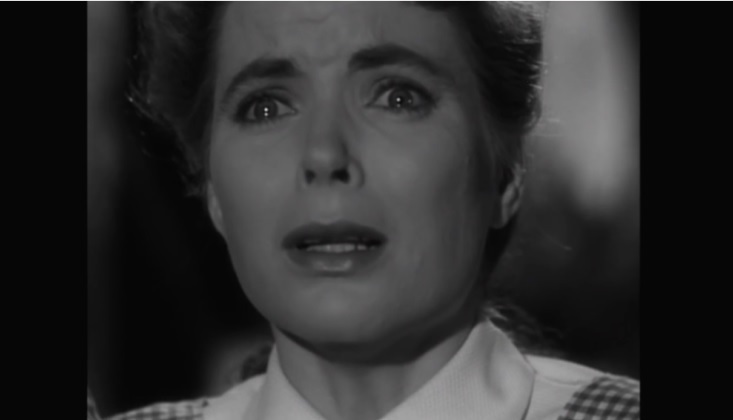 During this scene, the camera stays glued to Helen’s face, slowly magnifying and illuminating her pain and anguish. Her face crumples into agony, echoing the Expressionist painter Edvard Munch’s Scream. Her silent scream is repeated later in a dream sequence. It begins with Helen bidding Dr. Parry goodbye after agreeing to leave her job and go away with him to seek treatment. She closes the door and turns her head slowly backwards as she starts thinking fondly of Dr. Parry. Her face moves from shadow to light like a waxing moon, signifying a hopeful change in her fortune. According to cineCollage, “Expressionist actors worked against an effect of natural behavior, often moving jerkily, pausing, and then making sudden gestures” . Film Sufi elaborates “The goal of the construct [was] to evoke mystery, disharmony, hallucination, dreams, alienation, extreme emotional states, and destabilization” . Helen then goes off into a reverie which marks the beginning of the dream. The Warren house is all decked up for Helen and Dr. Parry’s wedding. Everything is going along swimmingly. The chaplain is reciting the vows and he asks Helen to say “I do”. She is unable to utter a word. Like a stuck record, the chaplain’s voice drones on in the background repeatedly asking Helen to say “I do” as panic spreads through her. The wedding guests look on menacingly like a kangaroo court jury as the chaplain’s voice continues to echo around the house. We come back to reality to a close-up on Helen, her face mirroring her earlier anxieties. Her silent scream says more than any words could. Another Expressionist influence is seen in a thrilling scene when Helen goes down to the basement alone in search of the secretary Blanche. Armed with a single candle, she is framed in the passageway just like Blanche had been moments earlier. This is done to ratchet the tension and feeling of dread as Helen traverses the same path as Blanche. Helen finds her lying dead on the floor. Suddenly she stiffens at the sight of a newspaper leaf behind her swirling in the wind. Her hackles are raised as she realizes its significance. She turns slowly, beginning with her face drawn away from the audience. Slowly her face appears in view, fear writ large on it as she senses someone’s presence. The tension is drawn out unbearably, complemented by eerie music and a howling wind. Helen’s ‘head turn’ is a mirror image of her earlier one in the dream sequence. 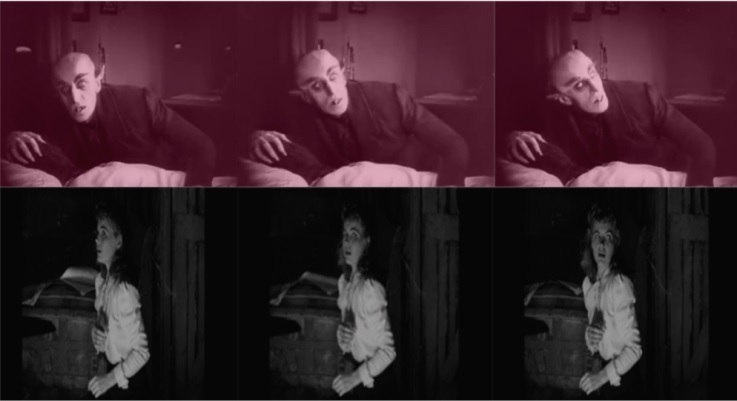 It also has strains of similar prolonged movement by Count Orlock in Nosferatu, an Expressionist classic, when he sees the rising sun and realizes to his horror that he has been tricked. Helen’s silence is finally broken while attempting to flee from the villain. However she doesn’t regain her voice in trying to save herself. Instead she screams in horror when the villain is shot at by Mrs. Warren, her charge. 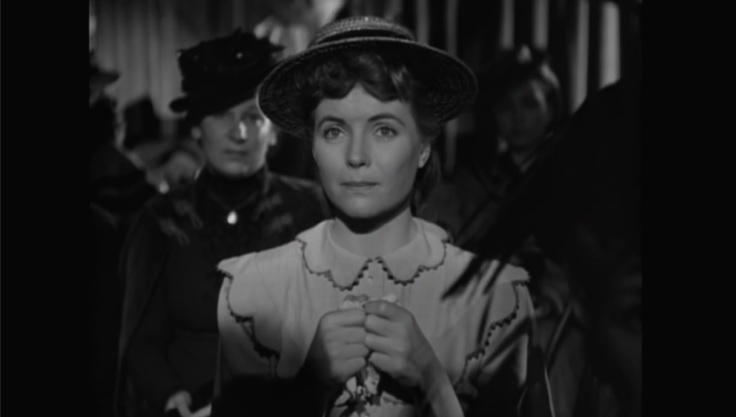 The shock of seeing her ward, an infirm lady, standing with a revolver menacingly and firing the shots rattles her. Helen speaks at last on the phone to her fiancé uttering the poetic words “One......eight......nine. Dr. Parry. Come. It's I, Helen.” The closing scene shows Helen collapsing in a chair, overwhelmed by her ordeal and at the sound of hearing her voice again. Her long black skirt coupled with her hands raised side by side give the appearance of her kneeling down in prayer in gratitude. The shadow thrown by the phone receiver directly above her head assumes the form of a scepter as if a higher authority has blessed her. The shadow of a nearby chair looks like a stairway to heaven. All the elements combine to charge the image with spiritual overtones, transforming her silence to salvation. 1. Noir, “Noir Filmography of Robert Siodmak”, Dark City: Film Noir and Fiction. 2. Justin Wolf, “Expressionism Movement Overview and Analysis”, The Art Story. 3. cineCollage, “Expressionist Film or Weimar Cinema?”, German Expressionism, cineCollage. 4. The Film Sufi, “Expressionism in Film”, The Film Sufi, (28 June 2008).